Did you know that snacking could lead to health and weight-loss benefits?! While there may be studies that claim otherwise, the results lead to positive benefits if you snack appropriately. I admit… I’m a constant snacker. I could snack all day and continue to consume three full meals. Although I’m a health-conscious eater, I can’t help but want to snack on chocolate, chips, and anything salty. Munching on carrots and celery sticks every day can get boring quickly, which is why I believe in maintaining a balanced diet of healthy foods and not-so-healthy-but-good-for-your-soul foods. 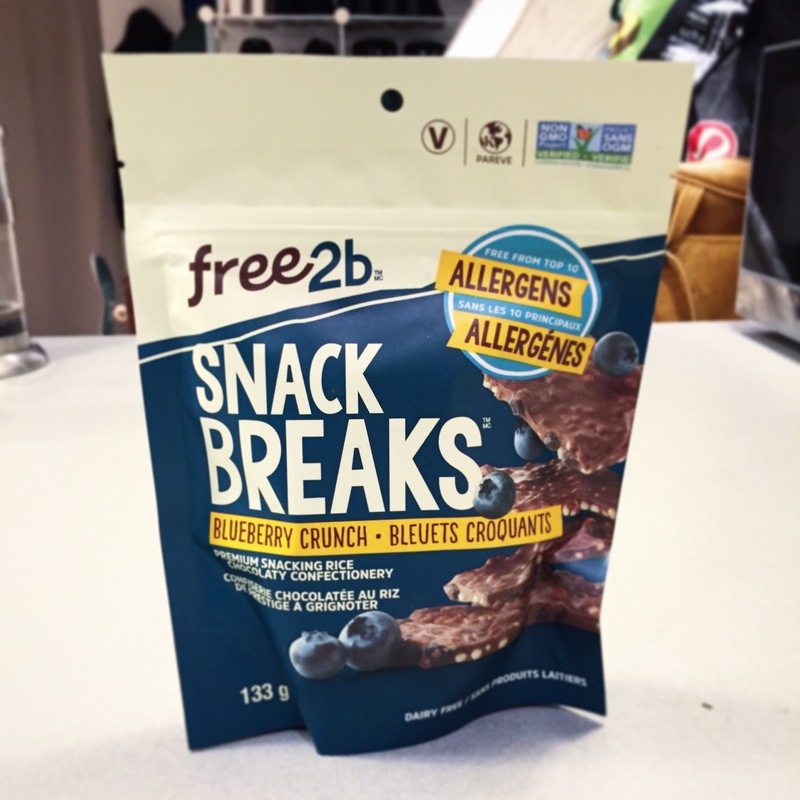 free2b’s Chocolate Blueberry Crunch Snack Breaks are a great choice for a snack that’s satisfying and won’t completely derail your diet. The bag consists of chocolate bark pieces made with premium snacking rice, chocolatey confectionary, and blueberry bits. Each chunk is sized perfectly so you’ll only need to eat one piece to feel satisfied, making this snack a suitable for a quick energy boost. When I reached for these treats I found that I only needed one piece to satiate my craving. You can find bits of blueberry in each bite, and while I’m not typically a fruit & chocolate mix fan, I found this delectable because the blueberry taste wasn’t overwhelming. The combination was well-balanced, which is often lacking in other fruit + chocolate mixtures. Aside from this being a gluten-free product, all Snack Breaks are free from the Top 12 Allergens. This product is free from corn, coconut, milk, mustard, sulphites, fish, shellfish and crustaceans. Their facilities are also peanut free, soy free, gluten-free, tree nut free, egg free, and sesame free. I had this product for about five weeks before finally trying it and when I did, it was still incredibly fresh and crunchy! Thanks to its resealable package, you can keep this product on the shelf for quite some time and it’ll maintain its quality. Store these in your office snack stash, bring it with you on-the-go, or devour it in one sitting, the choice is yours! After consuming the entire product, I can definitely say that I would recommend it to friends. I am also intrigued about the other Snack Breaks varieties like the Dark Chocolate Peppermint and Dark Chocolate Cranberry & Pumpkin Seeds. I can’t wait to try the next one! This entry was posted in Information and tagged chocolate, gluten free, snacks, top 10 allergens. Bookmark the permalink.